Published Tuesday, September 17, 2013, OK personal/derivative use; link www.lovethatimage.com. This post is linked to Shadow Shot Sunday 2, Pink Saturday, Monday Mellow Yellows, Our Beautiful World (Yellow), Outdoor Wednesday, Nature Notes Wednesday, Straight out of the Camera Sunday, Fishtail Cottage Thursday, Today’s Flowers, Floral Friday, Weekend Flowers, Garden Tuesday, Macro Monday, I Heart Macro Saturday, Saturday Show Off and My Romantic Home. Thank you so much for browsing around here first! WOW~! !~that is a stunning photo~! the colors, the light, the beautiful details, it’s perfect~! «Louis» has a WW Linky today and welcomes your visit! That is simply Wow. Stunning. What a lovely rose this Peace is and I know how lovely her fragance is. Have a wonderful day Sara greatings from Holland. Gorgeous!!. Looks good enough to eat :). I LOVE having flower or fruit flavoured teas, you see. Your macro shot is just amazing. Thank you for this lovely share @ Our Beautiful World!. This is breathtakingly beautiful … I can almost smell the heavenly scent! Thanks so much for sharing with us at Our Beautiful World! What a delicate colour. Perfect name. Lovely peace rose. Wish our world could be as peaceful as a rose. Another beautiful bloom, love the mixed of peachy pink and yellow, awesome share, thanks for linking up at Our Beautiful World! I will try again. A box appeared that said I needed to fill in all the boxes, but I had. lol! Don’t you just love computers? 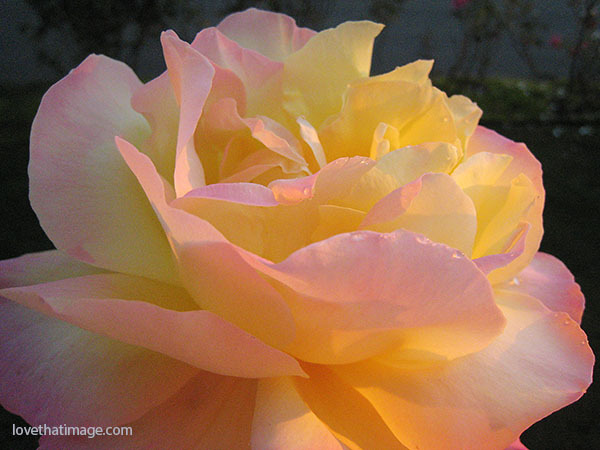 I had written that this is a beautiful photo of one of my favorite roses! I became acquainted with the Peace Rose when I was a young girl. It was one of my Mom’s favorite roses in her rose garden! Last blush… just beautiful, Sara. This is beautiful! Love the layers of petals! Stunning! Love the way you captured the light on the rose petals. Stunning tones in this beautiful rose. Such a lovely play of light round and through the petals. Stunning image ….. Thank you! Oh la laa and stunning!!! wow what an inner glow! This magnificent shot just “oozes” peace from every petal! The epitome of roses…sheer perfection. Lovely!!! The lighting is wonderful…the petals look almost translucent! This is the most beautiful picture of a rose that I have seen–it is also the most beautiful picture that I have seen. Thank you to who ever captured it for us.